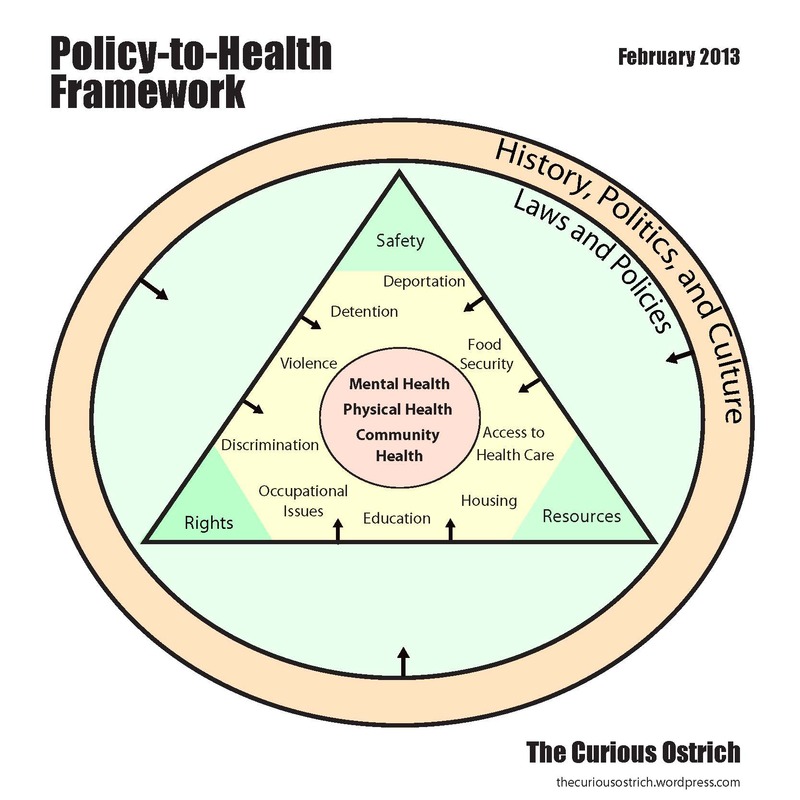 2013: New opportunities for healthy immigration reform? 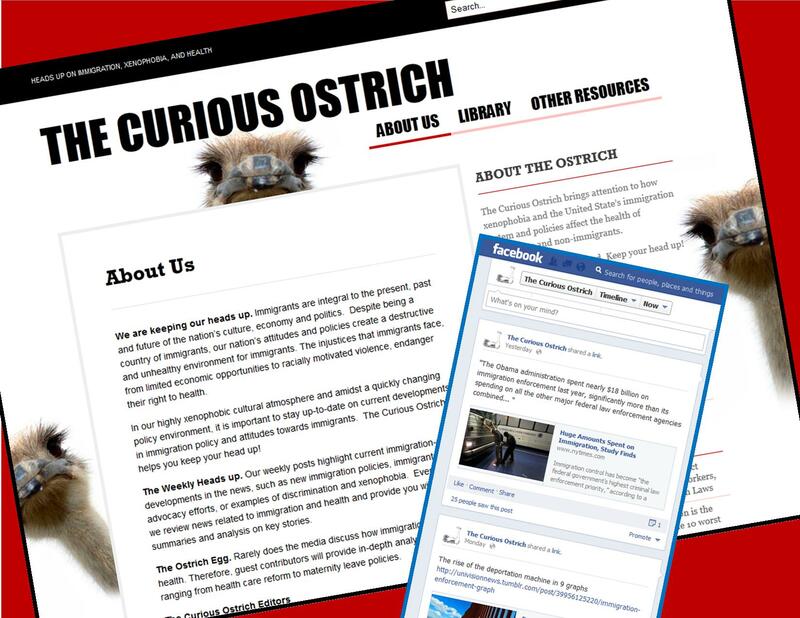 The Curious Ostrich has big plans for 2013! We are now moving to a monthly format, providing readers with in-depth analysis and commentary on the public health impact of immigration policies and national conversations around immigration. As always, our mission is to bring attention to the ways immigration policies affect health and to provide information and resources for health and immigration advocates alike. Want regular updates on immigration issues? Like our Facebook page! Over the course of 2012, a number of policies and events across the country significantly, and often negatively, affected the health of immigrants and their communities. Deportations continued at an all time high, separating families and at great cost to our economy. Due to programs such as Secure Communities 1.6 million people were deported during President Obama’s first term. Our nation’s growing immigration enforcement system now receives more funding than all other federal enforcement agencies combined. This focus on enforcement and a militarized border increased border violence and resulted in many deaths, some perpetrated by the US Border Patrol itself. Immigrants also continue to be denied many basic rights. For example, while the Affordable Care Act (ACA) goes a long way in expanding access to health insurance, undocumented immigrants and Deferred Action for Childhood Arrivals-approved individuals are barred from new health insurance programs. At the state level, although the Supreme Court knocked down many of the provisions in Arizona’s immigration bill SB 1070, the “paper’s please” provision will move forward. Other states continue to follow Arizona’s lead in anti-immigrant legislation. The impact of xenophobia and anti-immigrant politicking is not limited to immigrant communities. For example, in 2012 the Violence Against Women Act, a traditionally non-controversial, bi-partisan bill, failed to be reauthorized for the first time in its history. This was in part due to Republican supposed opposition to protections for immigrant women. In 2012, we also saw promising policies and inspiring activism by undocumented immigrants, particularly youth. Influenced by ongoing activism by DREAMers, President Obama granted deferred action to “childhood arrivals” (DACA), creating the largest opening in many years for undocumented individuals to gain work permission and protection from deportation. While not a long-term solution, DACA created opportunities for many young immigrants. Exciting grassroots mobilizations also helped raise the profile of immigrant issues and pushed forward a more progressive policy agenda. The Caravan for Peace turned attention to the human impact of border violence and the United State’s role in drug war violence; undocumented youth are using art and creativity to assert their rights; DREAMers sat-in at Obama campaign offices; the Undocubus shared stories at the Democratic National Convention; and the Campaign for the American Dream team walked from San Francisco to Washington, D.C. to raise awareness about immigration policy. Create a path to citizenship for undocumented immigrants currently in the US. The increasing numbers of young immigrants applying for deferred action demonstrates that creating a process for undocumented immigrants to apply for papers is not only relatively politically non-controversial, but is feasible and has tremendous positive impacts. This is a start, but temporary status for a small portion of undocumented immigrants is not enough. There are still roughly 11 million individuals who lack papers and a path to citizenship. This is an injustice, not only to these individuals, but to their families and communities and the nation as a whole. Reduce deportations and keep families together. Enforcement programs and deportations needlessly tear people from their jobs, communities and families, with devastating emotional and economic impacts. A simple fix would be to end programs such as Secure Communities. In addition, policies are needed to end the fear that deportations have caused by creating clear delineations between local police officers and Immigration and Customs Enforcement. Create accountability over and reform the detention system. The unregulated and unhealthy network of privatized detention centers must be reformed and regulated. This should include expanding accountability and oversight for current detention centers. The all-historic-high number of detention beds in centers and county jails creates a gross profit motive and should be reduced. End the militarization of the border. Border fence and patrolling policies throw money into militarization, rather than the true safety of people in the United States. There should be an end to financial support for the border fence, reduction in funding for the Border Patrol, and increased oversight over the Border Patrol, including the training and background of officers and their use of surveillance technology. Increase access to education and social services for all immigrants. Immigrants should be positively included in public policies. This is a matter of both fairness and of effective crafting of public policies, as economic, social service and health policies ultimately have an impact on immigrant communities, such as the Affordable Care Act and the Violence Against Women Act. Access to health care— Many people are barred or have limited access to health insurance and health care services due to their immigration status. Access to regular primary care is important in preventing many diseases (e.g. diabetes), while limited emergency care services results in unnecessary deaths. Diminished rights and protections— Fear of deportation diminishes the rights of undocumented individuals by shaping their decisions about accessing services such as education or police protection. For instance, many undocumented workers are victims of wage theft, yet they do not have legal recourse without risking deportation. Access to resources— Diminished rights lead to reduced access to resources to lead a healthy life. For example, undocumented immigrants may choose not to access public resources, such as education or social services, because they believe they are not eligible or they are afraid of coming into contact with government officials. Discrimination— There is widespread anti-immigrant sentiment embedded in our national policy and media discourses, and anti-immigrant groups continue to advocate effectively for policies that devalue and dehumanize immigrants because of their lack of legal standing. From conservative politicians campaigning on deportation policies, to widespread discriminatory commentary in the news, there is a strong national narrative that a lack of papers justifies less-than-humane treatment. There are feasible policy solutions that can reduce the risks to and protect the health of immigrant communities. There are dynamic and mobilized advocates who will continue to fight for the rights of immigrants. Public health advocates can play a critical role. Therefore, in 2013, our hope is to see not a continuation of the short-term and enforcement-focused policies often associated with “comprehensive” immigration reform, but rather the promotion of healthy immigration reform.